Each township consists of 36 sections, each section being one square mile. 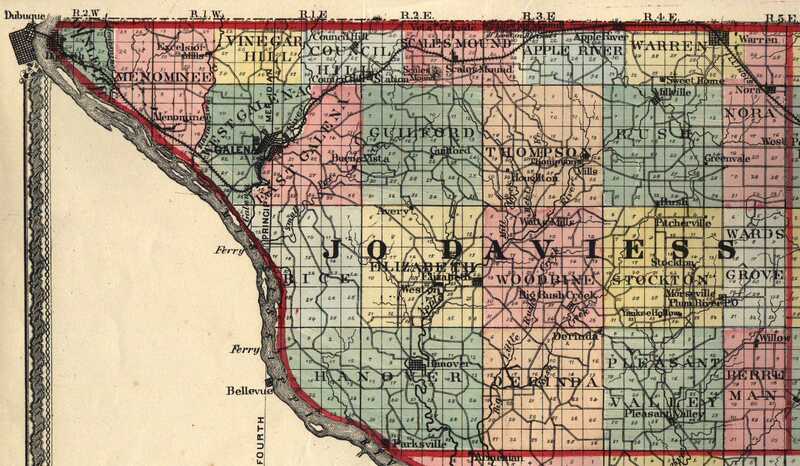 As of the 1990 census, Jo Daviess County had 23 townships: Apple River, Berreman, Council Hill, Derinda, Dunleith, East Galena, Elizabeth, Guilford, Hanover, Menominii, Nora, Pleasant Valley, Rawlins, Rice, Rush, Scales Mound, Stockton, Thompson, Vinegar Hill, Wards Grove, Warren, West Galena, and Woodbine. For more detailed information, please visit the Conner Prairie's Rectangular Survey & Federal Land Sales website.